The true origin of the folklore legend of Bloody Mary is unknown. The internet stories tell of people conjuring the real Bloody Mary spirit. 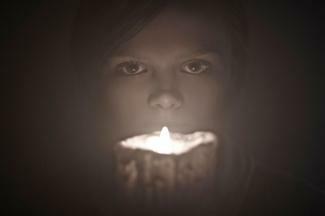 According to legend, seekers gaze into a mirror while holding a candle and repeat her name three times. These stories exist in several versions within many communities and serve as warnings to the foolhardy. Halloween Web™ features reader submitted stories of their personal encounters with Bloody Mary. One such story submitted by Matty describes the death of his best friend, Mike, as a result of trying to summon Bloody Mary. Matty describes how at the age of thirteen, the two pals decided to try conjuring the dark spirit. It was sometime between 10 and 11 at night when Mike went into the bathroom alone. For some reason, they believed the ritual wouldn't work if both of them went into the bathroom. The story centers around the number six. In this version of the legend, the friends needed to light six candles and write in red on the mirror the numbers 666. This is known as the number sequence for the devil. Matty and Mike used a red lipstick to scrawl the numbers onto the bathroom mirror. Once they had the candles lit, Mike closed the bathroom door, sealing himself inside. Matty stood outside the door, listening to Mike's muffled voice as his friend repeated "Bloody Mary" six times. The two waited for ten minutes, yet nothing happened. Neither friend talked. Matty became thirsty during the long wait so he decided to grab something to drink from the kitchen downstairs. On his way down the stairs, he glanced back at the bathroom door and saw the candlelight was still flickering underneath. When he returned, Matty was surprised to see the candlelight was no longer visible along the bottom space of the door. He tried to enter the bathroom, but the door was locked. He knocked for Mike to open up, but Mike didn't respond. Frantic, Matty pounded louder, rousing Mike's father downstairs. By now, Matty was terrified. Mike's father ran to get something to pick the door lock. When the lock finally turned, he couldn't get the door to open. Matty and Mike's father pushed hard against the door, but it wouldn't budge. For over 15 minutes, the two of them shoved against the door until at last they heard a thump, and the door gave under their weight. Inside the bathroom, they discovered Mike's slumped body with his head bowed over in the sink. Mike was dead! Matty concludes his story by warning others not to make the same mistake he and poor Mike did by attempting to summon the spirit of Bloody Mary. Originally published on the Castle of Spirits website, Victoria from Illinois tells a chilling story about her encounter with Bloody Mary when she was in college. During a Christmas break at home, she spent the night with her childhood best friend. The sleepover at her friend's house started with the two reminiscing about the many sleepovers they'd had during their friendship. They recalled some of the many games they played and other silly things they did as young children. Eventually, the Bloody Mary game came up. The young women laughed about their many fails when trying to summon Bloody Mary. They giggled about how the evil spirit never appeared in their mirrors, much less tried to grab or scratch them as the legend claimed. As the night wore on, one thing led to another, and the two best friends decided they'd try to summon the witch one more time and have yet another good laugh. The young women moved into the bathroom and closed the door. Victoria describes how the bathroom had no windows so when they turned off the light and closed the door, it was so dark it was disorienting. They couldn't see their hands in front of their faces. In the pitch blackness of the bathroom, the friends held hands, clinging to the comfort of knowing each was not alone in the darkness. Slowly, they began to repeat, "Bloody Mary." Victoria admits she lost track how many time they called the spirit's name. She guessed it was about 10 times before an image began to take form in the bathroom mirror. Surprisingly, the reflection wasn't of a face, but a strange green triangle shape. They stopped chanting. The two friends watched the tiny triangle expand slowly. Standing silently in the dark, they gripped each other's hand as the triangle continued to enlarge. Victoria later admitted she wasn't really scared at that point, more curious than anything. She was also confused why there was this strange triangle forming in the mirror instead of the ghostly Bloody Mary they'd expected to materialize. The women continued to stare at the triangle for about half a minute, still holding each other's hand. They watched. Suddenly, something grabbed Victoria's arm. She screamed in terror and so did her friend. Her friend fumbled for the light switch, and the light blasted away the darkness. Her friend opened the door and pulled her from the bathroom. They ran to the girl's bedroom and were so shaken they couldn't speak. Instead, they just stood staring at each other. Once they'd had time to calm down and realize they were safe, Victoria asked her friend if she'd seen anything in the mirror. Her friend described the tiny green triangle that had grown in size. She then told Victoria that she'd felt someone grab her arm and that was when she screamed and turned on the light, getting them out of the bathroom as quickly as she could. The women kept the bathroom door closed for the rest of the night and avoided it completely. Victoria ends her story by saying her friend refuses to use that bathroom unless she absolutely has to. She adds the bathroom is now the coldest room in the house. She admits that it is a very strange story, but assures the reader, "Although this story may be a little strange, it is all very true." On the Gods and Monsters' website, Cristina Louise from Yuma, Arizona relates her seventh grade experience summoning the terrifying spirit of Bloody Mary. One day after school, Cristina was playing over at her friend Maria's house. Around 6 pm, Maria's mom needed to make a quick trip to the corner market, and Maria wanted to tag along. Cristina preferred staying at the house and after much reassurance, Maria's mom agreed. Cristina settle on the couth to watch a movie while they were gone, but half-way through, she was bored. By now it was 6:45 pm. She began to toy with the idea of playing Bloody Mary. Oh, sure, she knew all the stories surrounding this legend, but she didn't give any of the stories any credence. Bored and wanting something to do, Cristina thought it would be fun to play around with the summons. Cristina entered the bathroom and gazed at her own reflection in the mirror. She explains how, for a few moments, it felt as though she were daydreaming. She was in a kind of daze when she came to herself. She closed the door, turned off the lights, and set about lighting the candles she'd found in the house. Lighting the candles in the dark bathroom, Cristina set one on the sink corner and another in front of the mirror. She held the third candle just underneath but in front of her face. Cristina bolstered her courage and managed to whisper, "Bloody Mary," but admits she was so scared it took her some time to get the words out. She didn't want to chicken out, but claims something made her stop after the first chant. Still, she ignored the inner warning, and it took several minutes for her to work up the courage to continue. This time she took a deep breath, but the words dragged out from her trembling lips as she spoke them, "Bloooody Maaaary." As soon as the words passed her lips, she began to feel very hot. Her skin felt as though it was going to melt and burst into flames. Her mind raced with all the stories she'd heard about people who completed the ritual. Panic set in. 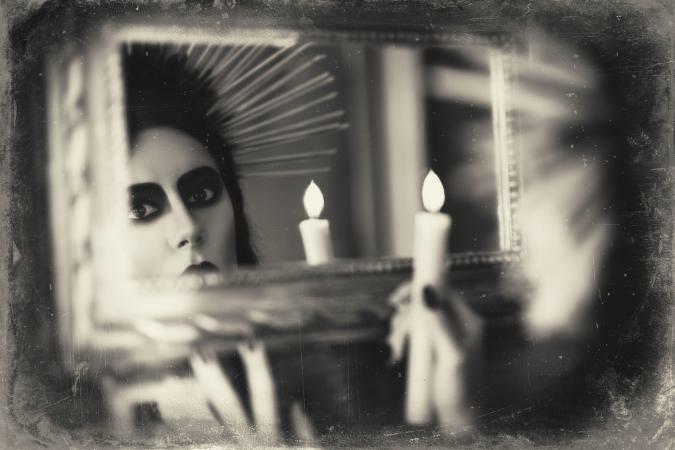 Staring at her reflection in the candlelight, Cristina was unnerved by how pale and lifeless she looked. Suddenly, she glimpsed a white spark behind her where the shower curtain was. She just needed to say the words one last time. She felt queasy and had become very hot. Her legs trembled underneath her, and the room began to spin. Still, she wasn't going to let her fear prevent her from calling the spirit for the third and final time. Very slowly, she managed to say, "Bloody." Suddenly, a jagged cold chill rushed over her. She had no explanation for where such a breeze had come from. The shower curtain opened behind her, but at first it didn't register in her mind. It was then that she noticed what she described as, "an ugly figure in the corner closest to me." She stared at the mirror reflection of the woman behind her. Her gaze was transfixed on the woman's face. Cristina described it as, "A very weird and creepy face. Her face was cracked, she was bleeding from her eyes." The spirit's face was pale, but very visible to the young girl. Cristina stared at the thin-lipped, dark-haired creature lurking in the corner behind her. With a sickening feeling, her heart sank to the pit of her stomach, and she instantly regretted ever tempting the malevolent spirit. She wanted to flee, but she was paralyzed with fear. Helpless, Cristina watched as the ghost moved behind her, drawing closer to her. Bloody Mary outstretched her arms to Cristina. Then, suddenly, there was a burst of white light. Cristina's face stung, and it felt as though her very heart would explode. Still looking into the mirror at the spirit moving behind her, the entity stopped abruptly and dropped her arms by her sides. Bloody Mary moved back into the corner and slowly lifted a finger to her lips as though to say, "Shh." Cristina claims the bathroom door swung wide open on its own, and the bathroom light flickered on. The candles were instantly extinguished, but she was still unable to move. Paralyzed in that spot, she tried to understand what had happened. Just then, her friend Maria spoke from the doorway wanting to know what Cristina was doing. 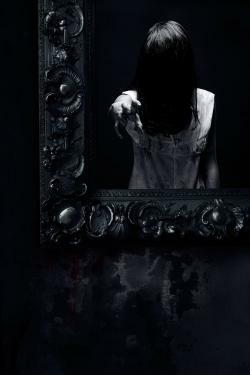 Startled, Cristina followed her friend's look to the bathroom mirror where a handprint marred the glass. She jerked around, but the shower curtain was back in place as though it had never been drawn open. Cristina nearly passed out, but Maria caught her and helped her from the bathroom. Slowly, she told Maria about what she'd done. Within a month, Maria and her family moved from the house. The reason for the move isn't given in Cristina's account of the events. Bloody Mary is one game that Cristina swears she will never play again. She closes her story by saying, "Believe me or not, I don't care. I know what I saw. I know what I experienced." Are stories of the Bloody Mary legend true? Whether the Bloody Mary legend is real depends on who you ask. For people who have had creepy experiences while using the Bloody Mary ritual, the answer may be a resounding yes. Others, however, believe overactive imaginations are the cause of experiences people share as scary and real Bloody Mary stories. These experiences may be driven by belief in the folklore surrounding the Bloody Mary story. It's easy to discount what one perceives to be ancient or urban legends when so many stories are plastered over internet websites. Many are clearly hoaxes, but some send chills down spines, especially when those telling about their encounters are so thoroughly convinced what they experienced was real.